Dangle and Snipe hockey isn’t only for skaters. 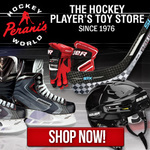 We also have experts who will help you find the best goalie equipment as well. There are many things you’ll need to consider when choosing goalie equipment. Don’t worry – from pads to gloves and everything in between, we’ve got you covered. Check out our latest articles about the best goalie equipment. Are you looking for hockey goalie chest protectors? Check out our list of the 5 best available. Check out our list of the best hockey goalie gloves.